Sporting a visitor centre straight out of the mid-70s, you'd be hard pressed to accuse this operation of being 'too touristy'. 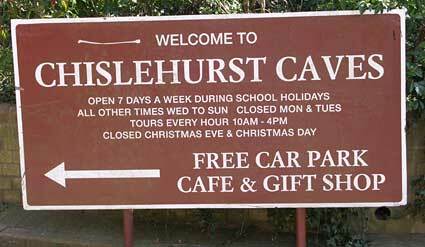 The entrance to the caves is at the end of a quiet suburban street and there's certainly no 'Chislehurst Experience (TM)' on offer - and it's all the better for it. Fact! Chislehurst is the Saxon name meaning 'Gravel Wood'. It's all a pretty lo-tech operation. Visitors gather at the entrance, pay their four quid and then they're escorted down a covered walkway into the caves' entrance. As you go in, you're invited to grab one hurricane lamp between each group of four and then follow the jovial tour leader. Here he's showing us a wall map of the caves. 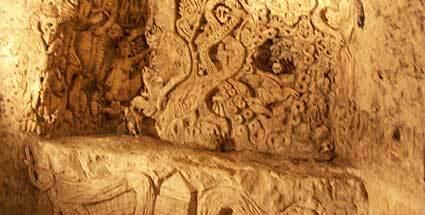 There are over 20 miles of caverns and passageways, dug over a period of 8000 years. 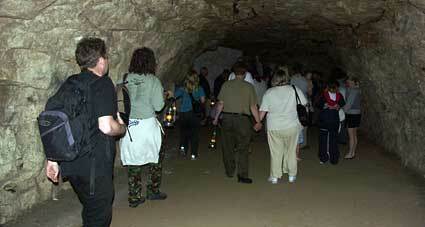 The vast complex of caves are a maze of ancient mines originally carved out in the search for flint and chalk. They are divided into three main sections, Saxon, Druid and Roman. Each section was later connected by digging joining passages. Being an underground cave, things were mighty dark although it's quite hard to illustrate that point with a camera! The only lighting in the caves came from the kerosene lamps we carried and if you wandered away from the main tour for a moment without one (as some Urbanites were want to do! ), it was eerily pitch black. The caves became a bustling underground city during the Second World War, accommodating 15,000 Londoners taking shelter from the Blitz. There's around 22 miles of man-made passageways to explore, although I wouldn't recommend wandering off on your own. For most of the walk, the floors are fairly flat, so perhaps my all-weather, super-rugged Gortex hiking boots were a little over the top. The caves were used as an ammunitions depot during the Great War of 1914 and became part of the Woolwich Arsenal. A narrow gauge railway was installed to transport the munitions through the passages. 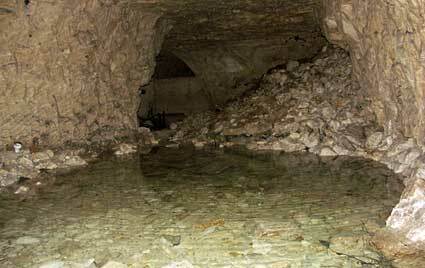 The army vacated the caves in 1920. 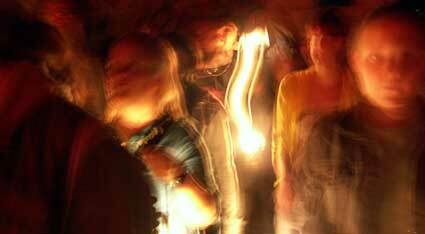 A bevy of Urbanite minxes emerge from a tunnel swinging their hurricane lamps with gay abandon. Note the bricked up chamber to the left. (I don't know I'm asking you to note it, by the way, because it's not very interesting, is it?). One of the earliest mentions of the mines appear on a charter c1250, and a Mr Soper, 'Limeburner and Flintmaker' was known to have carried out his business in the Saxon section in the 1830's - this appears to have been the last time the mines were actually worked. In 1903, William Nichols, Vice President of the British Archeological Association, announced a theory that the mines were made by the Druids, Romans and Saxons. Naturally, this sent visitor figures soaring and soon other tourist-pulling attractions were added, including several underground concerts arranged by the Crown Theatre in Peckham. With so many people stumbling around the caves, dogs were hired to seek out members of the public who had strayed from organised groups and found themselves completely lost in the maze of passageways. The carvings above are modern and you don't need an archeologist to work that out - if you look towards the bottom you can see the outline of Canary Wharf! I think I must have missed the tour guide explaining this bit, but for some reason he took it upon himself to bang this huge metal box with a metal rod. The resulting thunderous sonic wave probably triggered a few heart attacks amongst the stragglers and left me with an accurate re-creation of a post-Motorhead gig 'ringing ear'. Still, I did learn later that the resulting echo has been timed with electronic instruments to last, in suitable circumstances, up to 39 seconds. And that's a fact! It may look like an enlarged puddle to you, but this was where a woman murdered in the caves supposedly rises through a mist from the floor of the puddle, sorry, 'pool'. For years there was a challenge to any person to spend the night in the chamber. The story is that the last person to take up this challenge saw the woman doing her thang, all his candles blew out and in a state of pant-filling panic, he legged it towards the main entrance. En route to safety, he banged his noggin on a low passage and was found unconscious the next morning just inside the main entrance. Since then, the challenge has been withdrawn. 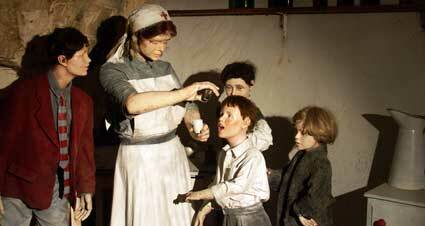 Truth is, I found some of these pale manikins more scary than the haunted chamber. The nurse appears to be sporting Cherokee feathers in her hair while the schoolboy looks like he's trying to score drugs. Talking of which, in the late 1960s, the caves were the 'it' place to 'take a trip' with bands like Led Zeppelin, Pink Floyd and Jimi Hendrix getting the subterranean heads nodding. Even more impressively, the caves were also used for one of Dr Who's famous lo-tech backdrops and the glitter they sprinkled on the walls to make them look 'other-wordly' is still extant! Half of the Walk Club met up at the Market Porter pub (by Borough Market) before getting the train from London Bridge to Chislehurst station. Conveniently close to the station is the dodgily named 'Ye Olde Stationmaster' where we met up with the Deep South Crew. 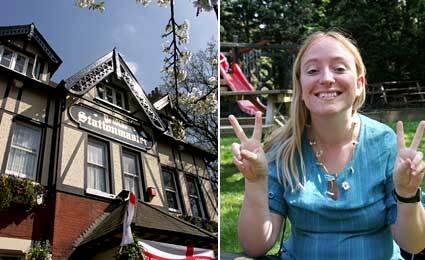 Built in 1870, the building was known as the Bickley Arms Hotel until 1997, and was a popular Edwardian tourist attraction with an entrance to the Chislehurst Caves conveniently located in the gardens. It's a bit tatty now but there's a reasonably large garden out the back where the assembled Urbanites enjoyed some cool beers in the glorious Spring sunshine. Some of the more 'earth child'-inclined decided to make daisy chains from the plentiful supply in the garden, while the guys talked about football in manly voices. It was such a pleasant day that it was quite hard to drag the walkers away from the garden. 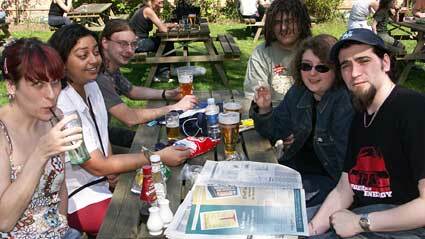 The beer was fine while some of the more adventurous tried the pub food. Verdict? Basic. Very basic. But cheap.